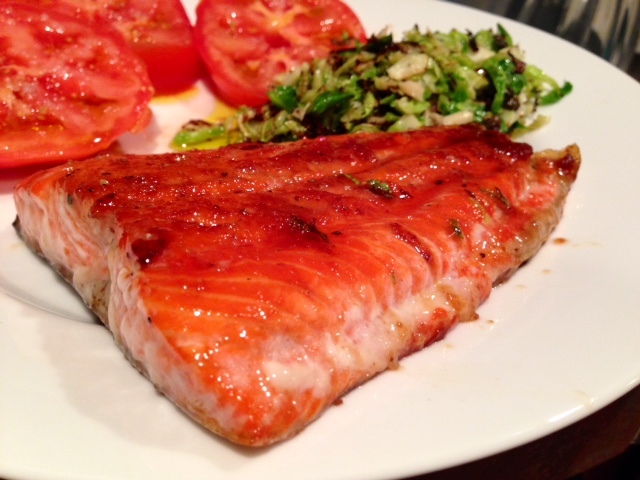 Salmon is one of my favorite simple, healthy dinners. It cooks quickly, is super versatile, and is such a nice break from boring chicken. This recipe can be made either entirely on the stove or finished off with a nice broil in the oven. Besides the salmon, everything else in this recipe is a pantry staple, and you can throw it together in like 10 minutes total. 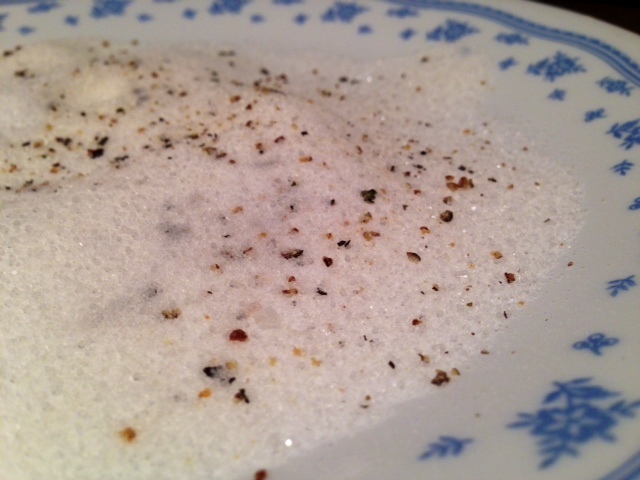 Mix the sugar, salt, and black pepper together in a shallow bowl or plate. Carefully dip each filet into the mixture and coat the entire surface of the salmon with the sugar/salt mixture (including the sides and skin). Heat a little bit of olive oil in a large nonstick skillet over medium heat (don’t recommend going higher). If you’re planning to finish it in the oven, make sure you use an oven-safe pan. 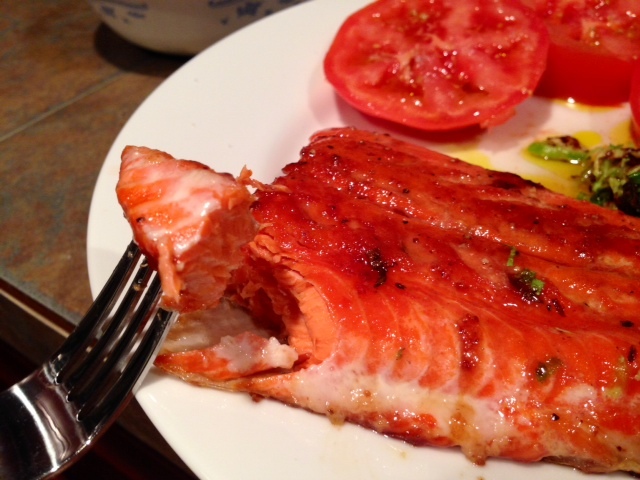 When the oil is hot, add the salmon, skin side down in the pan, and saute for about 5 minutes. If there’s a lot of oil splattering, turn the heat down. Flip the salmon—carefully, to keep the skin on—and saute for another 2-3 minutes. If the filet is super thick, you may need to kind of flip it on its side to get them, but most salmon filets aren’t that thick. The best option is to use the oven to finish it, gives it a lovely caramelization on top. Preheat the broiler to 450 F. Sprinkle the top of each filet with another teaspoon or so the sugar/salt mixture. Transfer the pan from the stovetop into the oven. Let the salmon broil for 5-10 minutes (I’d say less, that seems crazy based on my broiling experience). Check occasionally to make sure it’s not burning. 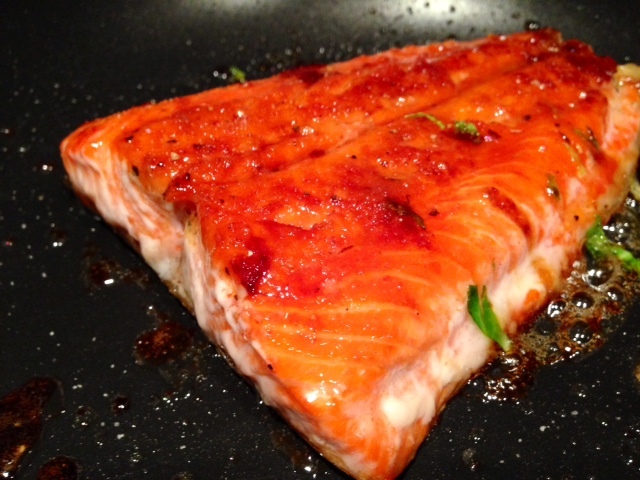 The sugar in the pan might look burnt but that’s okay as long as the tops of the salmon are looking golden brown. If you don’t want to heat your oven up because it’s a million degrees in your house, just sprinkle some extra sugar/salt mixture on top of the salmon and turn the heat up a little, letting it cook for another couple minutes. When the salmon is done cooking, remove from the oven or stove and allow to cool for a few minutes because that sugar gets HOT. But make sure to eat it while it’s fresh! Sugar and salt and mmmm! Combine the sugar, salt, and black pepper in a shallow bowl or plate. Dip each filet into the mixture and coat the entire surface of the salmon (including the sides and skin) with the sugar/salt mixture. Heat a little bit of olive oil in a large nonstick skillet over medium heat (don’t recommend going higher). 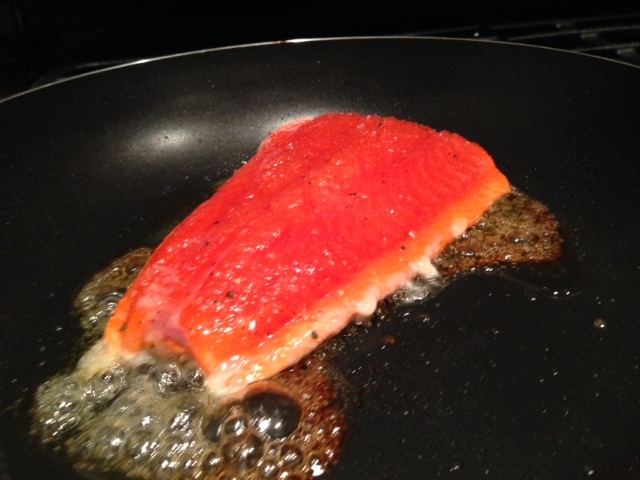 When the oil is hot, add the salmon, skin side down in the pan, and saute for about 5 minutes. If there’s a lot of oil splattering, turn the heat down. 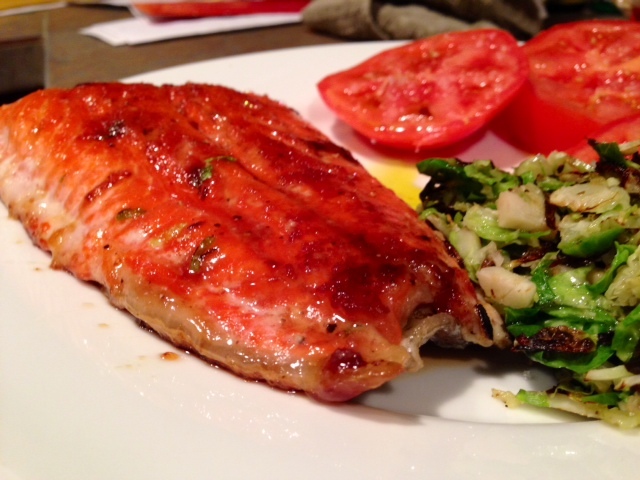 Flip the salmon—carefully, to keep the skin on—and saute for another 2-3 minutes. If the filet is super thick, you may need to kind of flip it on its side to get them, but I didn’t need to with mine. Preheat the broiler to 450 degrees F OR see step 5 if you don’t want to use the oven. 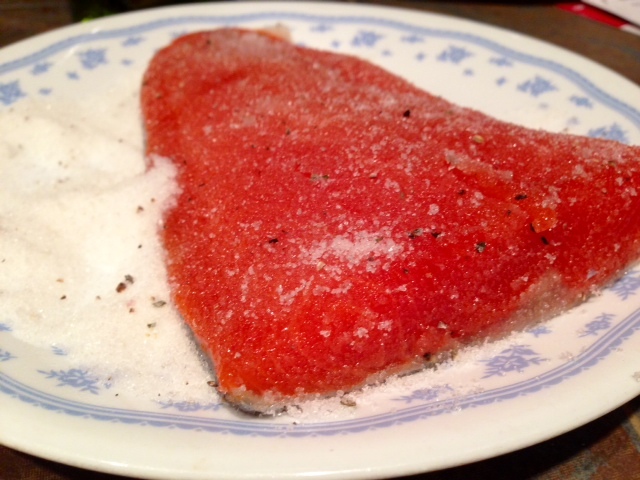 Sprinkle the top of each salmon filet with another teaspoon or so the sugar/salt mixture. Transfer the pan from the stovetop into the oven. Let the salmon broil for 5-10 minutes (I’d say less), checking occasionally to make sure it’s not burning. 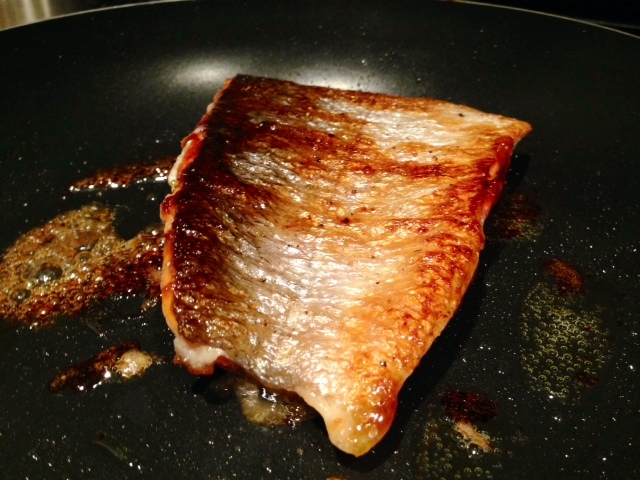 The sugar in the pan might look burnt but that’s okay as long as the tops of the salmon are looking golden brown. If you don’t want to heat your oven up or don’t have an oven-safe pan, simply sprinkle some extra sugar/salt mixture on top of the salmon and turn the heat up a little, letting it cook for another couple minutes.